Creating Magical Foodlore Moments Linda and Cindy have been friends for over thirty years. Together they have created many magical foodlore moments for their family and friends. After retiring from successful careers, Linda as a software entrepreneur and Cindy as school superintendent, they decided to fulfill a lifetime dream of working together to teach others how to enjoy the art of creating foodlore stories together with family and friends. 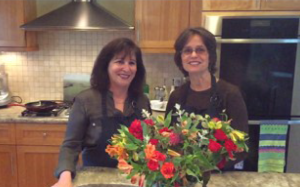 Two Friends in a Kitchen – The Art of Creating Foodlore Moments…Linda and Cindy cherish meals at the family table. The family table is the place where everyone comes together to catch up on the day’s excitement (the good and the challenging), laugh, talk politics and sports, solve problems, share touching moments, celebrate birthdays and holidays, and to honor their traditions, family, and friends who they both cherish more than anything life has to offer. Two Friends in a Kitchen will unlock the secrets of preparing simple, healthy, and home cooked meals while enjoying creative moments with those you love. Two Friends will take the work out of cooking and help you discover or rediscover the fun of preparing a meal as a group of friends or family, the accomplishment of spending an afternoon preparing foods in bulk and freezing the dishes for a rainy day, or how to experience the pride of creating a scrumptious meal in less than 30 minutes. Whether you want to learn about great recipes, become a better cook, have more fun in the kitchen, or learn how to cook from your heart, there will be something for everyone each week on this website. Whether you decide to follow them yourself, or with a special friend(s), or with your son, daughter, spouse or partner, join them on their journey at www.twofriendsinakitchen.com. View all of our recipes in one location here!